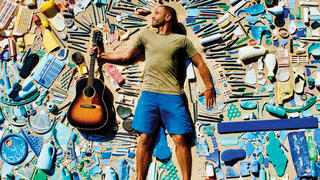 American musician Jack Johnson has joined the fight against plastic pollution – one of the biggest threats to the world’s oceans – with the release of a new film called The Smog of the Sea. 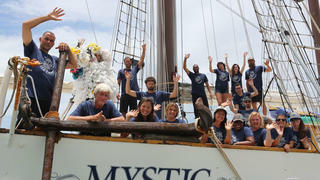 The film follows Johnson, marine scientist Marcus Eriksen of the 5 Gyres Institute and an unusual crew including surfers Keith and Dan Malloy, spearfisher Kimi Werner and bodysurfer Mark Cunningham on a week-long journey through the remote waters of the Sargasso Sea on board 51.81 metre sailing yacht Mystic. The team sail through the ocean using a trawl to collect plastics as they go. However, instead of finding the huge ‘garbage patches’ they were expecting, the team discover that the water is, in fact, polluted with millions of tiny plastic shards. These microplastics create a ‘fog’ within the water that is incredibly difficult to clean up and can prove deadly to marine life as the plastics contain high levels of chemical pollutants and are easily ingested by fish, birds and other sea life. Many of the larger pieces of plastic collected by the team, including shopping bags and bottle tops, were found to have bite marks in them. This, of course, is dangerous not just for the fish but for the entire food chain as the chemicals are absorbed by any predator that eats the fish – including humans. Directed by Emmy-nominated director Ian Cheney, The Smog of the Sea employs Super-8 footage and underwater filming to call attention to the deadly effects single-use plastics are having on our oceans. Johnson and crew member Simon Beins also created the score for the film which include a title track called Fragments. Johnson will continue to raise awareness of the single-use plastic problem during his recently announced 2017 tour with promotional posters like the above. Since 2005 Johnson and his crew have committed to a plastic-free backstage as well as offering free water for concert attendees to eliminate the need for plastic bottles. In 2014 Johnson helped launch the Reusable Pint Program to encourage fans to purchase reusable cups instead of plastic ones and it is now in place at all venues owned by Live Nation.